This is definitely a fantasy novel and although it is not the genre I normally read I enjoyed it thoroughly. Since this is the first of I think it is 5 (possibly more) books in this series it does leave you hanging and wanting to know what happened next. I am not going to write too much --the information below is more then enough to whet your appetite for-especially if you or your teen love reading fantasy novels with a bit of the old good vs evil thrown in-and an romance that eludes the ages. Okay, I'm going to give you a bit of a head's up. 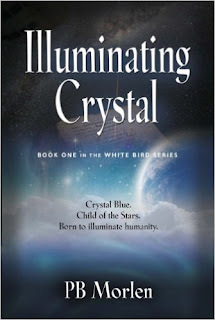 My debut novel, ILLUMINATING CRYSTAL, Book I in the WHITE BIRD SERIES, is not your average fantasy novel. And, along with that, my heroine, CRYSTAL BLUE, is not your typical teenager. Think of my book like this: PHILLIP PULLMAN MEETS DAN BROWN IN NARNIA. Don't get me wrong. ILLUMINATING CRYSTAL has got all the ingredients of a fun fantasy novel: magic, adventure, and pulse-pounding action, and CRYSTAL thinks, acts, and has the same sort of problems as other girls her age. It's just that she and her story are different. How? Because CRYSTAL is an Avatar, or rather, a person who can walk between worlds, and a rather reluctant one I might add, and unlike fictional fantasy stories, ILLUMINATING CRYSTAL might make you question what is real about our world and what isn't as a lot of my story is based on factual information. You see, in reality, the world is in the dawn of the FIFTH AGE. The indigenous of our world understand this more than modern man does. They have their creation stories of when humanity was at this point before. Moving from the Third Age into the Fourth. Sadly, most of mankind did not survive, but their stories did. But this time it will be different. Why? Because in 1987 an event occurred that set humanity and earth on a new course, a course for illumination. This is where CRYSTAL comes in. Being a Child of the Stars, she's born for a specific purpose: she must travel the world, meet with the indigenous and discover their secrets. Why? Because, like I explained before, humanity is entering the FIFTH AGE. And, believe it or not, it's going to get pretty 'wild' for awhile during this transition. Crystal's mission, if she succeeds, will help humanity transition from one age into the next. But, as I said before, CRYSTAL is a bit reluctant. She'd rather not go. Having been miserable for most of her life, this is how she's sort of a regular teenager, she's just found a bit of happiness at her new job and really doesn't want to go gallivanting around the world. Unfortunately, she has no choice. The indigenous I spoke of earlier who have their creation stories understand the spiritual world and live in a way that keeps them close to their creator. They are the keepers of ancient secrets that I believe many have tried to keep hidden. Why? Because, believe it or not, many powerful people don't want the general population to realize how special they are. You see, there are ancient codes and practices that the indigenous still abide by and they are willing to share these secrets, yet powerful forces do not want them shared. For over thirty years I've been investigating this curious, yet disturbing occurrence and now, as we move into another age, I think it's time for some of these 'secrets', secrets of the 'divine' human to be shared. ILLUMINATING CRYSTAL will take you on an adventure and you'll meet the characters who you will form an attachment with and will ultimately travel the world together, laugh together and cry together in a series of books of which there will be at least seven. Download the sample or buy ILLUMINATING CRYSTAL and begin the journey now! Eighteen-year-old Crystal Blue was born to illuminate humanity. When she finds an ancient manuscript in the basement of a bookstore, an intense transformation activates the eleventh layer of her DNA in preparation for the mission she was born to fulfill: she must travel the world and unveil the secret and sacred knowledge held by indigenous groups, knowledge that will illuminate humanity, secrets that dark forces have killed to keep hidden. The transformation harnesses her with unique powers, but also makes her vulnerable to these dark forces that now seek to destroy her. But there's a problem; Crystal doesn't want to go. She's just moved to Minnesota to re-kindle her relationship with her older sister, Claire. And she's finally found a job that she adores in "The Blue Crystal", a bookstore where she meets elderly, Cosmo Attis, the owner who suspects she might be his long-lost niece. And, Crystal has fallen hard for his broodingly handsome partner, Adam Walker. After years of being lonely and miserable, she's finally found a bit of happiness. But after she discovers the manuscript, unfortunate and mysterious occurrences abound: bold, blue streaks magically appear in her dark, dreadlocked hair, strange faces appear in the mirror, Adam begins to ignore her, and a botched kidnapping leaves her bleeding to death in a 7-11. Crystal learns of her fated mission from the man who rescues her: Dr. David Lange, the charismatic physics professor who now decodes the ancient manuscript and who, she discovers, shares her dreams. Soon, fantasy becomes reality when Crystal is attacked by a gigantic gold serpent in David's home. Fortunately Crystal is saved by an unsuspecting yet familiar assortment of characters who have watched over her since birth. Their leader shares a story that that is so unbelievable that Crystal begins to fear for her life...and so she should. As it becomes clear that no one around her is who they appear to be, Crystal is in mortal danger as another attack finds her at death's doorstep, one where her memories are stolen, making her mission even more tenuous. But there is one who now protects her memories and he will prove to be her greatest soldier and champion. The world is changing as it enters into the Fifth Age and darkness may come. But as the world sets out to experience the greatest compassionate shift in human history, only an enlightened and illuminated humanity will survive the coming changes. Crystal, a child of the stars whose ancestor walked in the stars, must be persuaded to shoulder her fate, accept her mission and harness her unique gifts: powers held only by Avatars and Masters. And, she must do this before the darkness finds and destroys her. Will she go? Will she accept her fate? Will she leave the one she loves behind? PB Morlen lives her life looking for the next fascinating moment, whether in a book, behind a tree in the woods, around a city corner, or at home. Having spent the last thirty years of her life traveling through life's 'mystery schools,' seeking the secrets of the divine human has taught her to trust her own voice, listen to her heart and pursue her dreams: simple secrets to a magical life. A lover of metaphysics, sword play, dragons and magical worlds, her novels, from present day to ancient times, offer the reader a wild dose of reality mixed with fantasy in a grand adventure where dreams are most common and divine secrets are unveiled. When she's not working on the next novel in her White Bird Series, she's out in the garden, on another adventure, discovering new authors or lost in a good book. She lives in Minnesota with her mother, two very small dogs forever under her feet, and three cats who insist on being in her books. Truthfully I am not sure where I first saw this book or how the e-book version ended up on my Kindle! Did I win it? Was it a free e-book from Amazon? Maybe someday I will remember!! All opinions expressed are my own honest opinions. For more information please check my Disclosure Statement. Our giveaways are in no way sponsored or promoted by Facebook. I have definitely been trying to read more books within the Fantasy genre recently. It is a great way to escape from the everyday stresses. I saw this on your facebook, the cover is gorgeous. Congratulations on the authors Debut novel, sounds like quite an adventure to follow. I am not a fantasy reader, either. But I do like books that have the "save humanity" plot. Great review. I sooooo enjoy series that leave you wanting to read the next book. I haven't read a fantasy book in a long time and this sounds good. I'm really interested in the compassion shift mentioned in the book. Sounds very interesting. I don't get to read as often as I would like. I really like that there are 5+ books in this series. I LOVE a good series...and anymore there's normally only 3 or so books! Sounds like a very interesting plot! I have been looking for more books to read. This one looks great, I'll add it to the list! I tend not to be able to get into fantasy novels. It's all a matter of whether an author can get me to suspend my version of reality for a bit, and since this series is five books long I think that is precisely what they intend to do! I'm not normally into fantasy either but it sounds totally believable to me--a teenager born to do a job she doesn't want to do. I think this is one I could get into! Sounds super intriguing! Added it to my to read list! Fantasy has never been one of my favorite genres. With a plot like this one, I might be tempted to read more of it.